USHR reports that associate head coach Mike Bavis has resigned after fifteen seasons as an assistant to now-retired head coach Jack Parker. Bavis had been one of five finalists to succeed Parker. That position was awarded to David Quinn. A standout forward at Catholic Memorial High School, Bavis was a four-year letterman at BU, playing on teams that had a combined winning record of 123-42-15 for a .667 winning percentage, including three appearances in the Final Four—1988-90, 1990-91 and 1992-93. In both 1992 and 1993, he was voted New England's Top Defensive Forward Award by the New England Hockey Writers Association. In addition, both years he was voted the Bennett McInnis Award for team spirit. 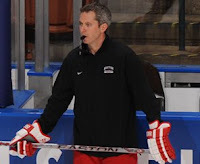 After playing in the Buffalo Sabres organization for two seasons, Bavis was an agent for Global Hockey Consultants before joining the Terrier coaching staff in 1998. He became associate head coach in 2009. Bavis also has been involved with USA Hockey, working as a coach for the Mass/USA Hockey Satellite Training Program and serving as head coach or assistant the USA Hockey Select 15, 16 or 17 festivals. Bavis and his family founded and lead the Mark Bavis Leadership Foundation, named for Mike’s twin brother and Terrier teammate who died on United Airlines flight 175 on Sept. 11, 2001. The foundation awards scholarships of $3,500 to $5,000 to Massachusetts high school students who have made a difference in their communities or demonstrated leadership at their schools. 2013 recruit Jarrid Privitera finished his USHL career on a winning note as the Dubuque Saints won the Clark Cup championship, sweeping Fargo in three games. Privitera scored 26 regular-season points in 56 games for Dubuque, adding six points in eleven playoff games. Previously, he played for The Gunnery School, totaling 81 points in two seasons, and the North Jersey Avalanche. He's certainly a quality guy, and deserves a top spot. It's not a good situation to have tried, and not gotten the ring...then stay on. I thank him and wish him well for a top job, ....other than at the other school on Comm. Ave.